Recycling outmoded models and versions of electronic devices is made easy, simple and hassle-free through All Green’s reliable IT Asset Disposition Programs. Recycling old, obsolete IT products should be done only by experts. Let All Green help you now. Our ITAD Solutions are centrally managed and transparent. Let us help you dispose of your electronics. The destruction of old, sensitive hard drives, SSDs, servers, and data network channels is vital for businesses. Destroying recalled, defective IT equipment is designed to protect your business brand securely and tightly. Every computer unit has a usual lifespan from 18 up to 24 months. This is very short that will lead to a speedy accumulation of electronic waste. That’s why we need to understand the importance of e-waste management and handling to be done in a proper way. In this location, All Green offers Electronics Recycling Rancho Dominguez Services. This program is designed to provide peace of mind, risk-free results, and convenience. If you’re looking for the right e-junk solution, try to consider our offered services. Rancho Dominguez is an unincorporated community located in Los Angeles County, California. This is between Long Beach and Carson. The Dominguez Hills portion of the community was incorporated into Carson in 1967. 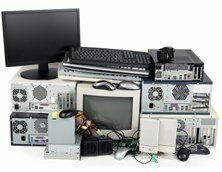 Following the link button below will allow you to schedule an e-waste pickup. Would you like to have a strong brand protection? If yes, then you need to try All Green’s ITAD Solutions. We have a centrally managed system that will address your e-waste needs in a transparent way. We can protect your brand through the destruction of the sensitive data as well as those IT equipment that cannot be remarketed anymore. How to reach out to us? Simple. You just need to click on the e-waste pickup schedule button, or you have to search for the nearest drop-off area. Either way, you will be fulfilled and satisfied. The locations on the map above are ready to be served nowadays. Our e-waste services are premium and world-class. You can count on us if you need proper solution to address electronic waste management problems. Pay attention to the list of services that we have below.